The ever-expanding world of Europa Universalis IV is ready to grow again with Rule Britannia, a new add-on that comes out March 20. 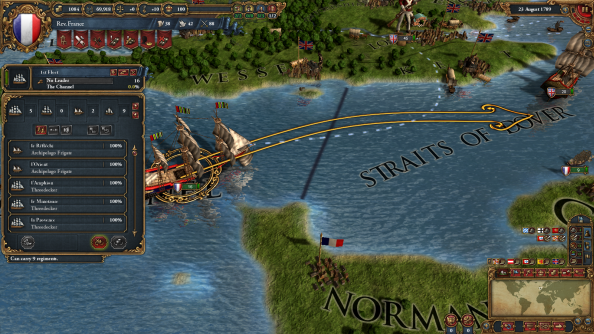 Here’s why we thought Europa Universalis IV was one of the best PC games of 2013. As the name suggests, Rule Britannia adds special missions for England, Scotland, Ireland, and Great Britain, which will work within the mission system that’s coming with Update 1.25. The Isles will also see the introduction of Anglicanism, which will include its own unique religious bonuses. The add-on, which Paradox are calling an immersion pack, doesn’t leave the rest of the world out, however. Late-game economies will be able to discover and use coal, which will fuel new technologies as nations push into the early Industrial Revolution. Being the first to discover new tech will also provide innovation bonuses like reduced power costs. Paradox say players will also be able to adopt naval doctrines that complement their playstyle, focusing on combat, maintenance, or trade. They can also steer trade from defeated enemies to boost their economies and share knowledge they’ve gained with allies. You can find more information on Rule Britannia over at the Europa Universalis IV Steam page, or at the Paradox store.